Runners will make their way down from the hills mountains of Usery Mountain Regional Park overlooking this eastern suburb of the Phoenix metropolitan area and into the city streets and neighborhoods of Mesa at the Sprouts Mesa-Phoenix Marathon, Half Marathon, 10K & Kids’ 1K, which makes its 7th annual running in 2018. Set to take place at a time of year when temperatures should only reach the upper 60s at most while those running the half marathon are out on the course — which is a wonderful thing considering that Mesa regularly reaches triple digits in the summertime — the race follows the second half of the full marathon course, which is a USA Track & Field certified course for qualifying for the Boston Marathon. While the starting line for the full marathon lies in Usery Mountain Regional Park — a roughly 3,600-acre park here in the lower Sonoran Desert on the eastern side of what is known as the East Valley, near both the Goldfield Mountains and the Tonto Regional Forest — the starting line for the half marathon lies at the mid-point of the 26.2-mile route, on East McDowell Road near Falcon Field airport and Boeing. From there, runners make their way through residential neighborhoods and through parts of the Escobedo historic district, where they’ll run past the Arizona Museum of Natural History and the Fitch baseball fields. Overall, the course unfolds along a mostly gentle downhill descent throughout the race’s 13.1 miles, dropping about 350 feet in elevation from the starting line to the finish line, which lies at the Riverview Shopping Center on Bass Pro Drive. At the 2016 race, more than 7,500 runners crossed the finish line in all races combined, including just over 4,100 finishers in the half marathon. 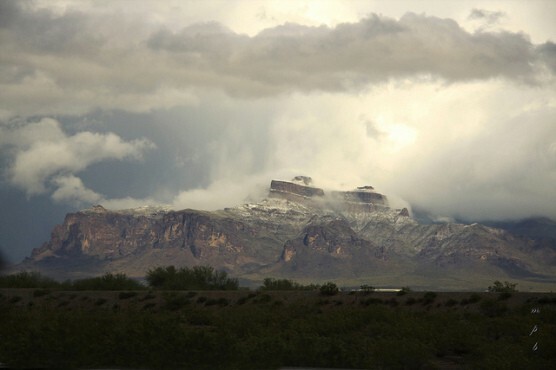 Located in central southern Arizona, about 15 miles east of downtown Phoenix, Mesa typically sees March temperatures that average between 45°F and 71°F, while rainfall totals average just over 1 inch for the month — the city’s third-highest of the year, but still largely dry. On the day of the race (Feb. 9), the average high is 44°F and the average low is 70°F. See the race route map for the Sprouts Mesa-Phoenix Half Marathon here. To reserve your spot in any of the race distances at the late winter 2019 running of the Phoenix Marathon, register online at the event website here. Ever run in the Phoenix Half Marathon? Share your impressions here, or post your review in the Comments box below. Missed an appointment cause I could not go further south than Brown Rd. Whoever said Saturday in not a day of heavy traffic needs to get out more. There is a LOT of Traffic in North Mesa on Saturdays! What poor planning! No signs suggesting an alternate route or when this is expected to be over. Who’s bright idea was this? If you live in north east Mesa you are stuck in your neighbor hood with no way out. As many others have stated their are many people that need to get to work place. I feel that it is very poor planing by the event cordinator and the city of Mesa, to leave residents no way to get to the place of work. I am in favor of our city (Mesa) hosting events but please think about those that are affected and have to get to their jobs. If we can’t come up with a better plan than we have now , maybe the race should be moved out of Mesa, to a area that is mostly farm land, cotton fields and alfalfa fields maybe out by Maricopa or east of Scottsdale. I live in a circle street right off of Brown Rd. and there is no way out…where do they (city) expect us to park? I have done this race for the last couple years and really want to do it for the at least the next four. However, I may be out of town this year and was wondering if you are still able to do the virtual run and still get the medal? The last day for deferment is January 31, 2016. You may only qualify for deferment if you have not deferred in the past year. So excited to run this race in February 2016! Obvious non-runners with no appreciation. I live right where it started last year and could see it starting out of my window. It was awesome site to see!!!! They were not there for ever, they started running and were gone. We the city of Mesa should feel lucky to have these people and attention to our awesome and beautiful city. We should feel lucky. The inconvenience is temporary and their are other side streets to use. But, must say City of Mesa needs to have large Orange signs for miles going outwards surrounding the event and should alternate routes in large orange signs as well. Then, all will be well. I live in Mesa this was very upsetting due to all the main roads being closed. I had difficulty getting to work. I don’t use the freeway. Maybe those that coordinate this can change it to a Sunday since less people work on on Sunday verses Saturday. Again was very upsetting and rude no side streets were open. Thanks City of Mesa events planner people for the inconvenience on February 28. This is the rudest thing that is done to the taxpaying citizens of this part of Mesa. I sure hope that a resident doesn’t have in their home doesn’t have a medical emergency, a house catches on fire or heaven forbid a terrorist event because we residents can not get out of our homes. A subdivision with over 200 homes and all exits but one blocked. Very inconsiderate so a bunch of nuts can run and inconvenience the portion of Mesa residents who pay the most taxes. Talked to several business along your route and they are highly ticked off too. This portion of Mesa is torn up completely already due to a water project, road work and SRP and you conspire to make people’s lives more difficult. In the event of an emergency, the race would certainly accommodate any sort of traffic needs into or out of a neighborhood. The race is on a Saturday morning, hardly a time of high traffic for most people. A race also brings in thousands of people who stimulate the local economy by staying in the local hotels, eating at the local restaurants, and shopping in the local stores. This comment really seems misplaced and / or uninformed. However, because of your concerns, I will tell everyone to avoid traveling to and spending money in Mesa because the taxpayers might not like it. I agree with Ka oxidize….this event was a rude disruption to traffic. I had a doctor appointment on Gilbert and Warner. As soon a I drove past Mckellips on Gilbert I couldn’t head any further south….no detour signs or any reasonable way to head south I missed my appointment. I had no idea this event was going on….nor did I have any idea that any event should be permitted to disrupt traffic on such a large scale. There is no reason to have an event like this. Go run out in the desert. This was totally a rude disruption to the road system. I am angry that I missed my appointment because of it. Inexcusable. I want to register for the Phx half marathon as a guide for a visually impaired runner for the Achilles Greater Phoenix group . REgistration website is not working,. © 2006-2019 HalfMarathons.net | All Rights Reserved. | Website Design by Hibiscus Creative.